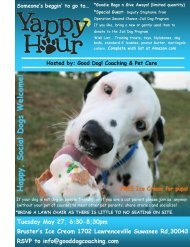 Join Us for "Yappy Hour"
Tuesday May 27th 6:30pm-8:30pm at the Bruster’s Ice Cream, 1702 Lawrenceville Suwanee Road, Lawrenceville 30043. Special Guest: Deputy Stephanie from Operation Second Chance-Jail Dog Program will share with us the good works they are doing in our community. We will have goodie bags and give aways (limited number, first come first serve) Also Bruster’s offers a free puppy cup of ice cream(for your 4 legged friend) with a dog biscuit included! Happy, social dogs welcome! If your dog is not dog or people friendly, or if you are a cat parent please feel free to join us anyway(without your pet of course) to meet other pet parents, share stories and socialize! Bring a lawn chair as there is little to no seating on site. Looking for the perfect Mother's Day gift? Why not give a gift certificate for Professional Dog Training or Pet Sitting by Good Dog! Coaching & Pet Care, LLC . The word massage for most people brings to mind images of a dark lit room, soft relaxing music playing in the background, the smells of incense filling the room, as you lay on a table feeling relaxed and calm. While these images are not incorrect, massage can be much more. There is a whole other side to massage that goes beyond offering relaxation. This other side is known as therapeutic massage, and this is the type of massage I offer to your four-legged family members. Cat or Dog at Risk? Heartworms and heartworm prevention for your dog and cat. This is such an important part of caring for dogs AND your cats. Yep, both. We don’t talk about heartworms in cats as often, and many clients do not realize that they can even be a problem for our feline friends. But it is something we need to discuss more often. And we need to work diligently to prevent them. Heartworms are aptly named, as they become residents of your pet’s heart. That detail alone should inspire a degree of fear in pet owner’s hearts. Read more here. Come visit our booth and join in the festivities. This is a great event put on by the Gwinnett Humane Society. My dog Cole always wears a standard buckle/clip flat nylon collar which carries her identification, microchip and rabies tags. However as a pet sitter & dog trainer I NEVER attach a leash to that collar when going for a walk or anywhere else. Why? That combination of collar with any leash can create a gap if pulled on either by dog or handler which can result in the collar slipping off the dog’s head (never a good situation for most dog owners). Read more here. ﻿Join Us for "Yappy Hour"
Sunny is a 10 year old white German Shepherd. He is a sweet old soul who loves to take his walks and enjoy the beautiful outdoors. He is always on his best behavior. He doesn't mind hanging out in his crate while at home while hanging out with sister Luna Bella. We are pleased to announce that Good Dog! Coaching and Pet Care has received the "Best of Lilburn" award for 2013 and 2014! 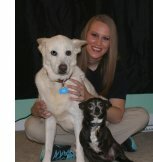 Angels Among Us Pet Rescue is a 501(c)3 non-profit volunteer-based organization dedicated to rescuing dogs and cats from high-kill shelters in Georgia. We operate through a network of foster homes in the metro Atlanta area. Our efforts are funded by tax-deductible contributions from compassionate people and organizations who care and want to help make a difference... one pet at a time. Good Dog! Coaching & Pet Care is so great with our two dogs and two cats. They leave us report cards each time, that I Love! They are fantastic. I highly recommend Good Dog! Coaching & Pet Care to take care and train you animals. They’re great and really know their stuff. I am so pleased with the results and training Sheba received. When I first called Good Dog! Coaching & Pet Care, Sheba was a bit much to handle. Now she is a very obedient, sweet and loving dog! I consulted a few trainers before calling Good Dog! and their prices, by far were the best I found. Thanks a million!